The Stevens County DFL welcomes you to our annual fundraiser. The Chili Chowdown will feature celebrity chefs making some of the best chili in the world. 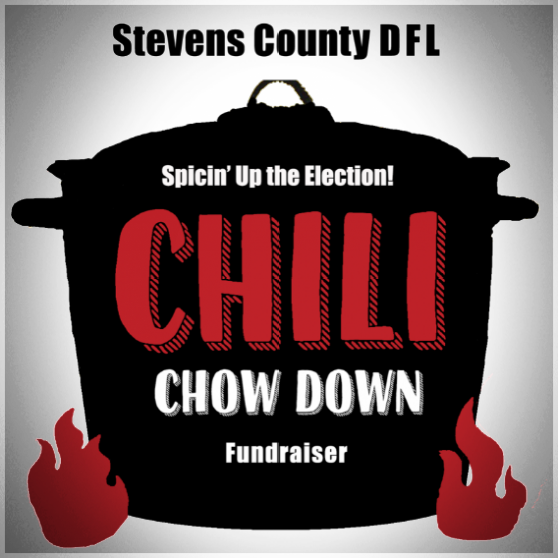 You will have the opportuniuty to sample these chili's and vote for the one you think is the best. And yes - there will be a vegetarian variety. There will be some games for the kids and a chance to talk to others about the upcoming election. There will be a couple "short" speeches given by Murray Smart and a representive for Tina Smith. Invite a friend or a neighbor to come along. So, circle September 15th 2018 for an evening of fun and food. Bring the whole family and enjoy the evening. This is a free will donation event. All monies will go to the Stevens County DFL to forward the DFL cause in Stevens county and SD12. We thank you and see you Saturday. If there is something you would like to see added to this web site PLEASE email us and tell us all about it. This is YOUR web site and this is YOUR party - The DFL Party of Stevens County! "Our politics are our deepest form of expression: they mirror our past experiences and reflect our dreams and aspirations for the future."